This is what the legendary voice yells right when appears the title, using a tone as intense as epic. 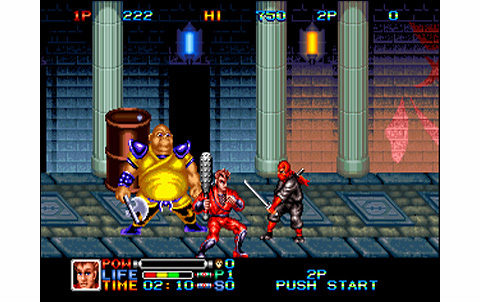 Besides, the voices are legion in the game, never heard of ninjas such talkative! 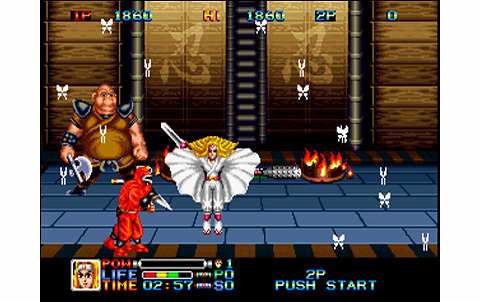 Ninja Combat was my first game on my first Neo Geo, it was Christmas 1991... I was thirteen! And I cleared the game hundred times, never getting tired of it. 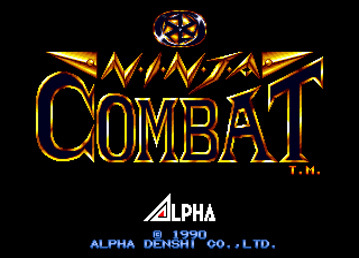 I had so much fun with friends on that one... As a child delighting a high-priced chocolate, I eat all Ninja Combat, enough to make my stomach blow up. Yet despite my nostalgia and all that this game means to me, it's still far from a masterpiece. Easy to say after twenty years passed, once programmers have released what was best or most of from the system, we can spit in the soup! Oh if it were up to me, I would be a Ninja Combat preacher. 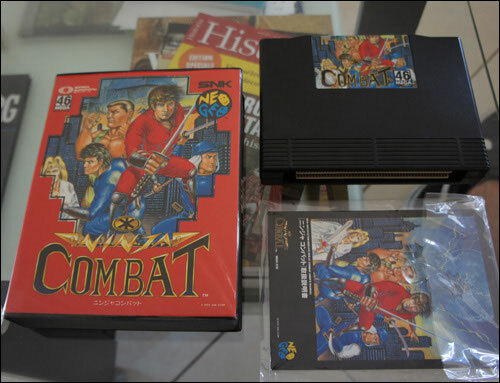 I loved so much this game when I had it in my game room, that I used to dream about it at night: Ninja Combat was a real blow for kids who had the opportunity to play it back then. But here I must be objective for this review, no question to be too gentle with this soft. 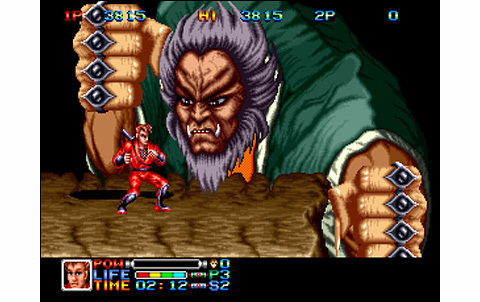 Graphically, the game is sublime, it has never been equaled later on Neo Geo. 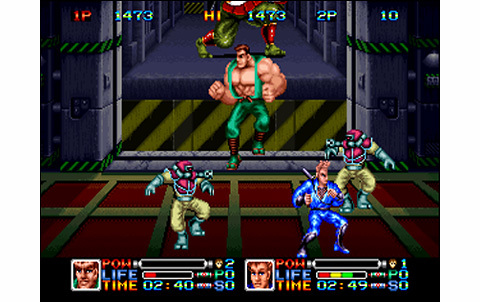 The animation, ultra decomposed, is a model of fluidity that even Art of Fighting 3 and its 298Mb can't match. The soundtrack is Dantesque: epic themes, incessant voices and screams, breathtaking fx... As for replay value, listen! Seven levels, you realize? It's so looooooooonnng! 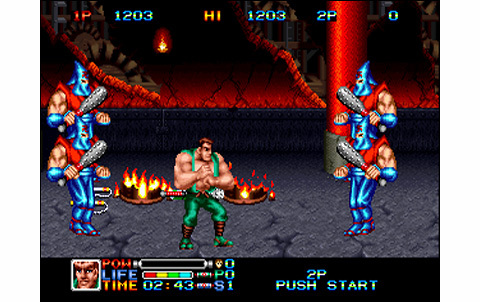 Ok, ok, let's get back to the real review... First of all, although the gameplay is pleasant and propose some cool ideas (different characters to choose from, power up, speed up, shooting shurikens...), it lacks essential things: close range fighting, punches and kicks combos, throws... finally anything else than launching projectiles! 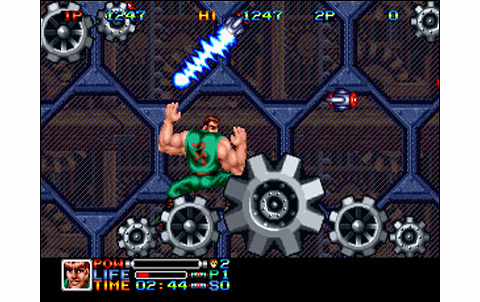 So yes, you still can throw shurikens, jump, perform a somersault, charge a special attack, and also use combined attacks. Another flaw, it takes less than thirty minutes to clear the game with infinite credits. 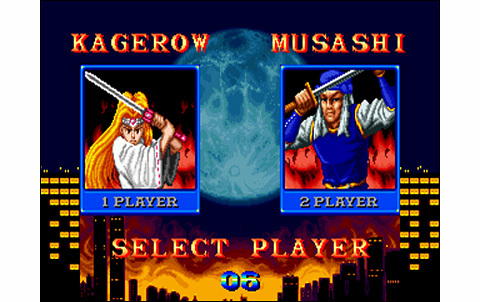 And even if I say players should better play with a single credit, then the game becomes tremendously difficult. 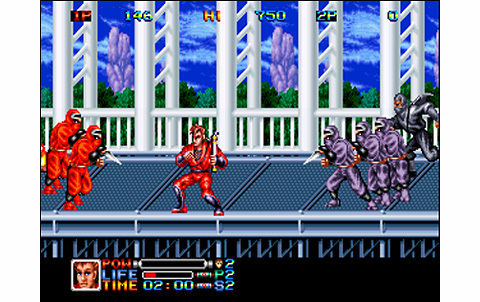 In total, there's five playable characters: the two ninjas and three different fighters who will join the team during the game. 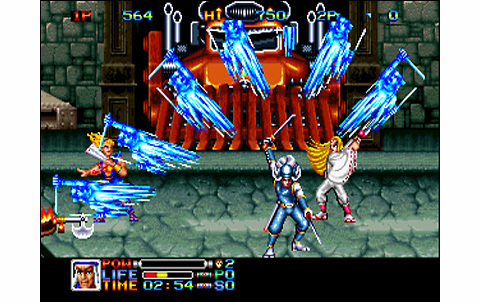 If all can be powered-up and speeded-up, only Joe and Hayabusa can pick up weapons. 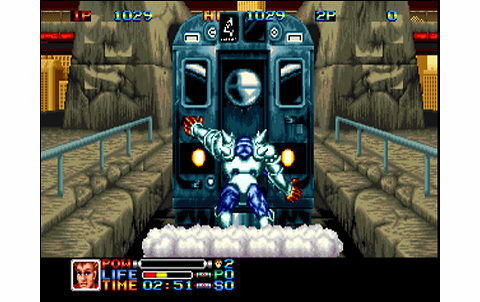 Graphically, the game still looks good, but it was clearly a blast back in 1990. 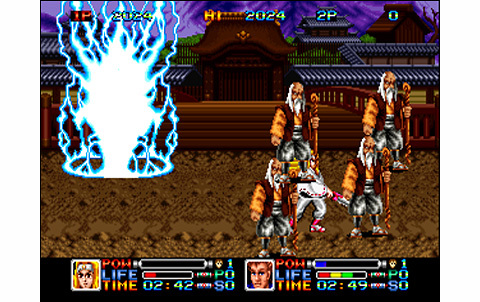 Oh for sure, Sengoku 2 and Mutation Nation have done much better since then, but show a little respect young people: Ninja Combat is the pioneer of its kind on the Neo. The stages are varied, the design is relatively thin, althought we can blame a lack of depth in some environments. But the whole work is still proving a great skill. Animation is doing good, quite fast and honestly decomposed; we only deplore a few bugs here and there, but no slowdowns to be reported, despite an impressive number of sprites simultaneously on the screen sometimes. 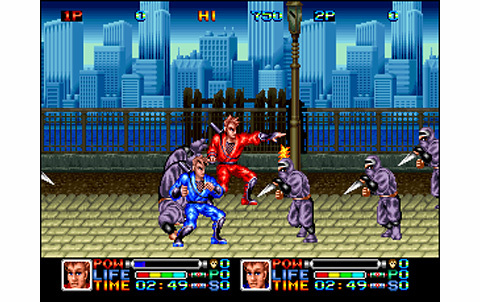 The soundtrack is pretty cool, very ninja-styled, with characters who love talking, and good "Bud Spencer' approved" slaps sounds. 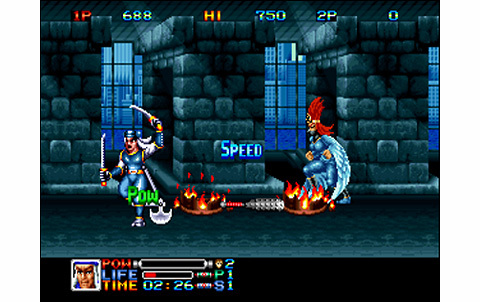 If Ninja Combat's realization is still respectable, it remains that the replay value is relatively low. 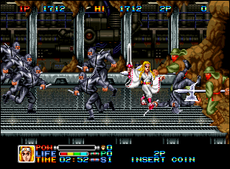 The game is diverse but a bit short, and too easy to finish with infinite credits (advice, if you have unibios, try it with five credits... as 1CC might be a little too hard). 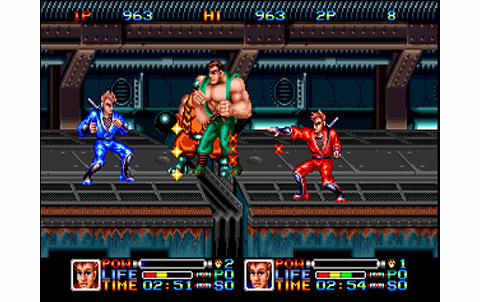 Ultimately, only the nostalgic and others beat them up addicts would go back willingly to this legendary game with pleasure. Now, of course there's much better in the genre. 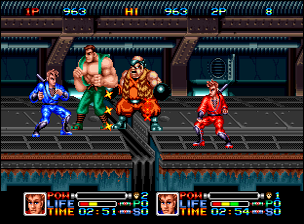 Of course, there are more beautiful games, even Final Fight released a few months before is a step up. 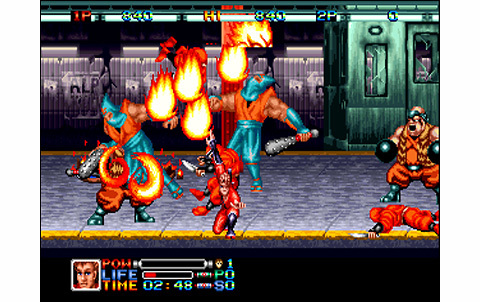 Ninja Combat still has a certain charm, a great retro look and a few original ideas, which certainly not erase his flaws, but still make it unique. Backgrounds, costumes, enemies: everything looks good, and Bosses are big and well drawn. Stages are varied but unequal in quality, lacking depth at times. Animation packs no frills but is still rich with details, with great zoom effects and awesome explosions. More differential scrollings and fluidity for some characters would have been better. 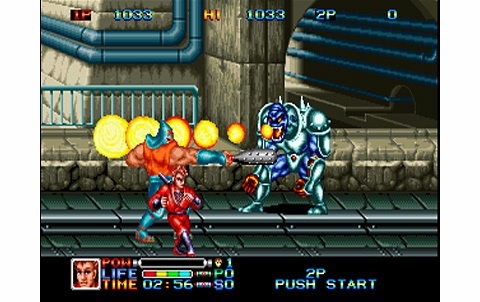 The soundtrack was the cream of the crop back in 1990, with its tons of vocals! 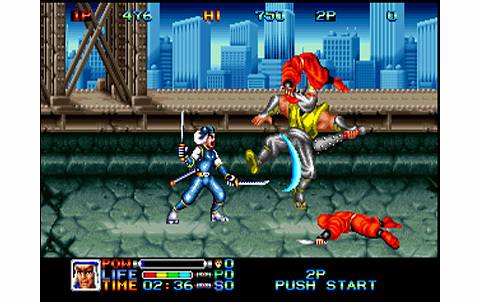 Certainly not a reference as a Beat them Up, Ninja Combat stands still as a good way to spend your nerves! 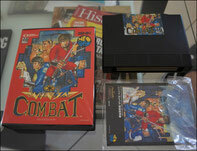 Not expensive, Ninja Combat is quite common and can be found for forty bucks on eBay and other sites. 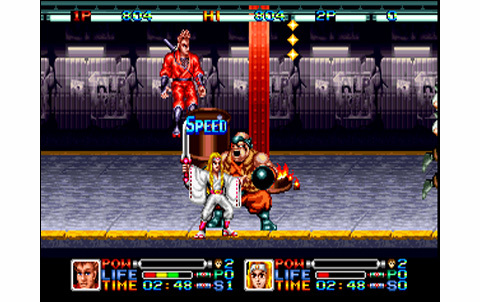 That's a great price for a Neo Geo Beat them Up (it's the cheaper of all) and a good challenge for 1CC arcade fevers!